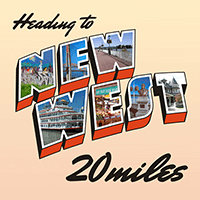 The New New Westminster Run is even better than the Old New Westminster Run... and the New Old Westminster Run. Concern for pedestrian safety led the City of New Westminster to remove the crosswalk over Stewardson Way at the far end of Crazy Homeless Homophobe (aka Grimstone) Park which naturally meant we had to modify the original classic New West Run in order to keep runners from diving over concrete barriers in the middle of a busy freeway. 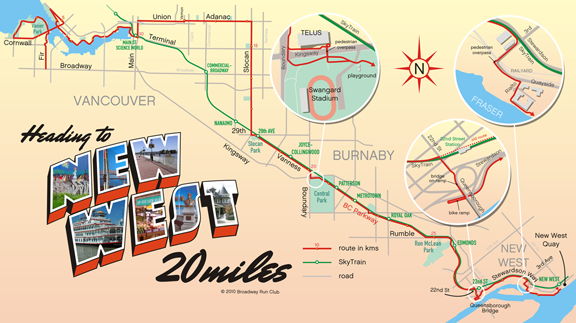 The new, improved version of the New West Run boasts the same nice climbs along the Adanac bike route and up Slocan to 29th Avenue as well as the steady and very runnable downhill on the BC Parkway from Burnaby to New West. But instead of an every-runner-for-his-or-herself scramble to find the best way across Stewardson in lieu of the dearly departed Grimstone crosswalk, the route now takes the more civilized way down 22nd Street to the Queensborough Bridge on-ramp and down a bike ramp on the other side of Stewardson before rejoining the old route. And since I had to redraw parts of the map anyway, I took the liberty of adding an extra detour on Pacific to where it merges with Beach, just to get the total run to clock in at pretty darn close to a nice even 32k. 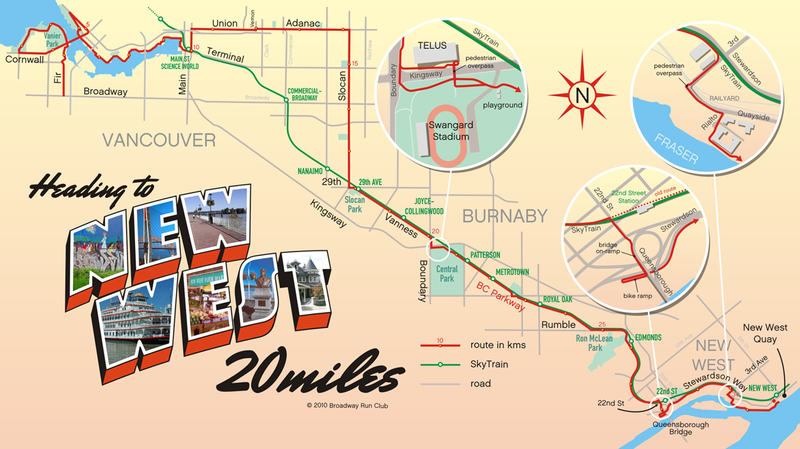 Nervous about leaving Vancouver for more than five minutes but still want to run most of the route and get in the full 32k? Try Jason’s Great Central Park Escape and stop in Burnaby just long enough to use the washroom!